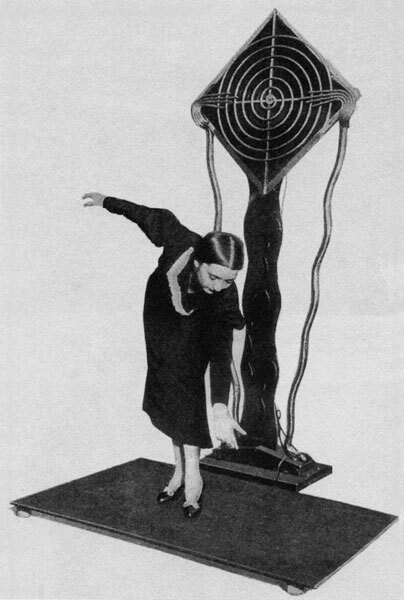 The Terpsitone, named after the muse of dance Terpsichorè, was a dance controlled instrument using the same capacitance principles of the Theremin. The Terpsitone was designed built by Leon Termen for his wife who was a dancer. The Terpsitone removed the control antena of the Theremin and replaced it with a large metal sheet hidden under the floor. Movements of the dancers in the area above the sheet caused variations in pitch of the Terpistone’s oscillators due to the capictance of the dancers bodies. This instrument was used for several ‘exotic’ dance, music and light shows throughout the 1930’s. “During his long and bright life, Leo Sergeyevich Termen made numerous discoveries and inventions. Among the different kind of brilliant inventions was the Terpsitone – which makes it possible for dancers to combine movement of body with music and light. Idea of the Terpsitone occured to L.Termen at the beginning of the 20th century, probably, immediately after the creation of Thereminvox. But as opposed to the Thereminvox where the pitch of tone and loudness depends on the position of the hands of the musician, the Terpsitone frequency and amplitude of sound are determined by a change in the position of entire body of a dancer. The operating principle of the Terpsitone is very similar to the operating principle Thereminvox, based on obtaining audio beat-frequencies, formed by theinteraction of high-frequency fluctuations of two oscillators. One has frequency rigidly fixed, while in the second is variable. In the second oscillator the frequency depends on a change in the distance between the capacitor plates of oscillatory circuit. One of the capacitor plates is an isolated, metallic plate placed on the floor of dancing hall, and second facing the body of the dancer. By moving through the space the dancer affects a change in the capacity of oscillatory circuit and, correspondingly, a change in the difference audio frequency. This signal is amplified and sent to the loudspeaker. Thus the motions of the dancer is converted into sound, which change synchronously with a change in the position of body. The possibility of adding automated colour is an additional special feature of the invention. The “visual sound display” is a panel with lamps, painted in different colours where the lamps light up to the motion of the dancer, moreover lamps with the specific colour corresponds to each note. However, this is ensured partially mechanically. 3.2) the invariability of the pitch of tone with the displacement of that dancing and the appearance of that corresponding to the position of the executor of the new height of sounding with the cessations of motion.